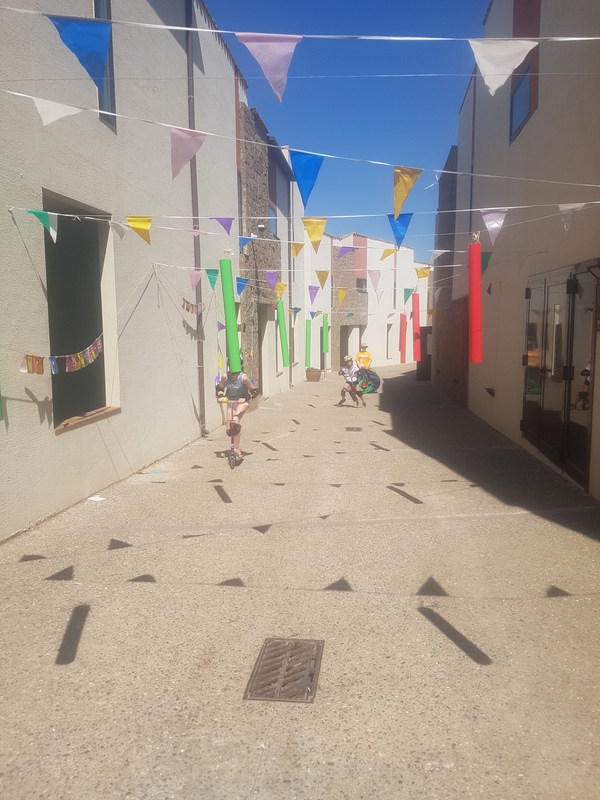 You are here: Home / Blog / News & Events / Our Stories / Zali and Kayleigh Take On Ribals! Zali and Kayleigh Take On Ribals! 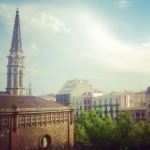 Day 1 our official first day in Barcelona, and wow what a welcome from the Ribals team. Barcelona and what a view on the balcony! Marc, Anna and Chris made us feel so welcome, and explained what the plans are for the upcoming weeks. We have been planning activities for the groups next week, and all sounds great. 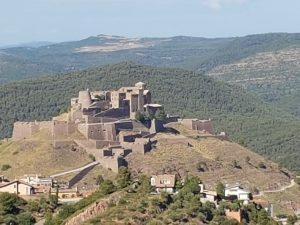 Can’t wait to get to Cardona now, see the castle and explore the fantastic site for our historical camp. We then got to go on a car journey for roughly 85km to go see tamarit castle, a wedding location for the rich and famous, but also the beaches are used for one of Ribals summer camps, they where doing water sports when we arrived, and the kids looked like they really enjoyed it. I have included a picture of the castle, it’s fantastic, well worth buying a hat if you’re invited to ever attend a wedding there. 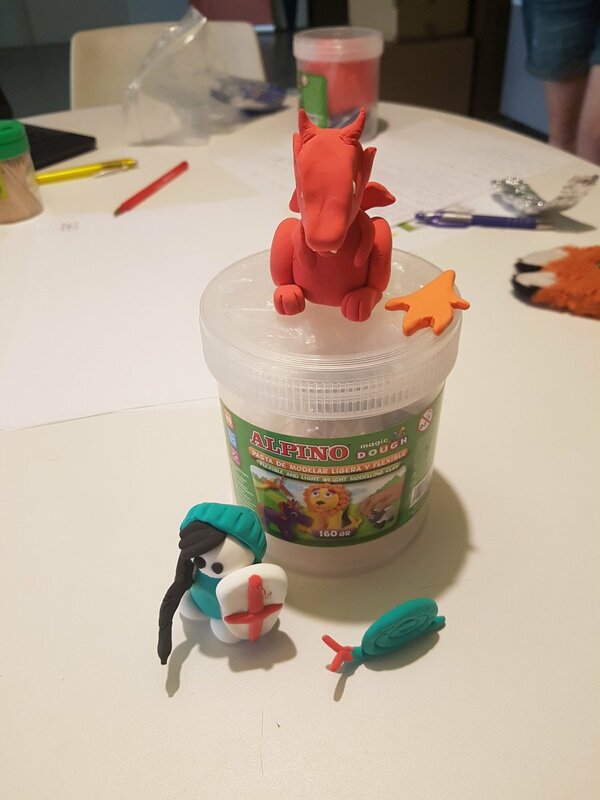 A busy morning creating knights and dragons ready for the historical camp! Will keep you updated on progress as our time goes on blog readers. Sorry for delay in the blog, it’s been a crazy few days with limited service, but back to full blogging capacity now, and loving Barcelona. 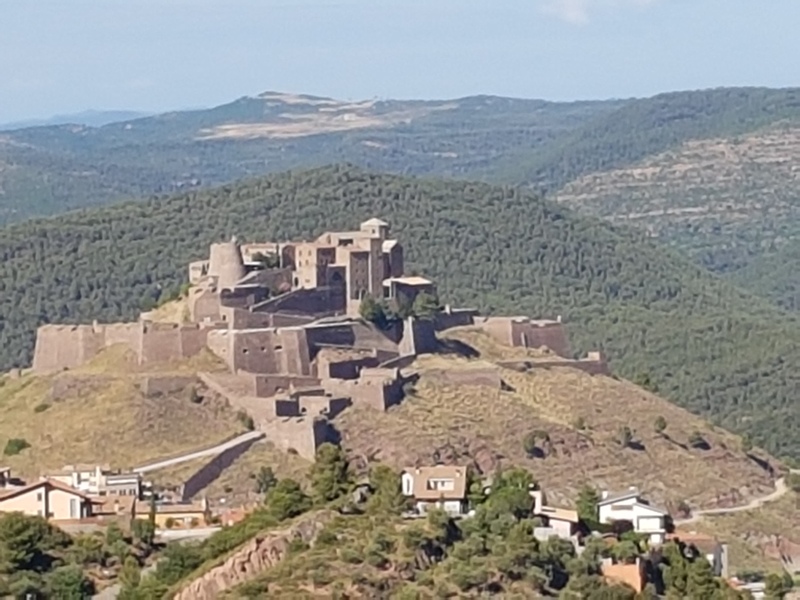 We are now in Cardona, and what a sight it is! Castle to the front, Pyrennes to the left – perfect!!! So today and yesterday we got the camp ready for the imminent arrival on Monday of our excitable young historical campers. 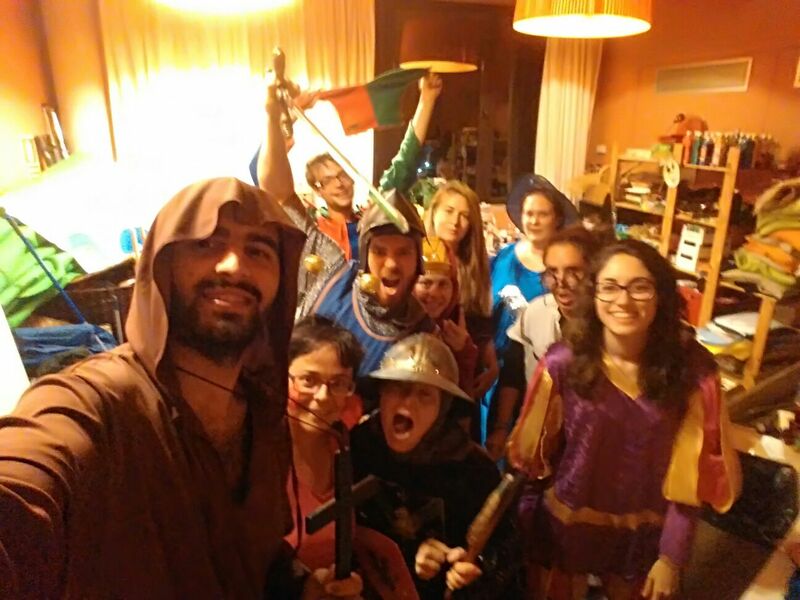 We got to help the animation team out and I have to say we had a really great time, we all did fancy dress and took a late night walk with the keen little guests (and parents) and I have to say, dressing up as a wizard is perhaps something I should of done sooner. Dressing up as a wizard is perhaps something I should of done sooner! We had great fun, even though we couldn’t fully communicate with the children due to language differences, they all had a amazing time and we assisted the team to give a entertaining walk. We have also been painting medieval based characters for the walls and doors in our section of the complex, pictures to come on that one. For now I will leave you with a great picture of all of us dressed up. Nobel knights and all. So today was our first full day with the kids and to kick off we obviously did some jousting, and knight worthy activities. When I say jousting, we got the kids to go against each other on scooters with foam swords, but it made us all smile! However I really loved how the activities are planned around these kinds of things. The children made up the bread and water mix to feed to the animals, and even with a few faces being pulled, they got their hands in and gave it ago. Then we did an activity of giving the children a code to break using the pictures of the animals, which kept them occupied, so I could change back into my magicians outfit for the night time relax activity! All in all a great day, tomorrow brings horse riding and a oudoor centre… fun times ahead! Hope you all enjoy a few pictures and reading the blog. So today was a great day for activities with the history camp. First of all we got to visit a equestrian school, where the children got to see all aspects of what was involved, from the joy of mucking out, to the eventual riding of a horse. It was really good to see how there confidence grew in such a small amount of time, and they loved the ride they had. It was great to see how inquisitive the kids are when they are in new surroundings. 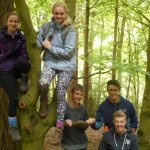 From there we moved onto a lake based activity centre, which had everything from rock climbing and abseiling, to rafting group activities and canoes. 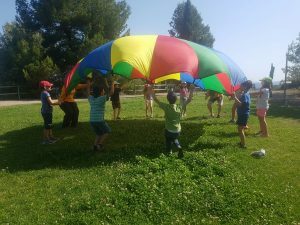 The kids loved it, and it was great watching them have so much fun, gaining confidence and growing with each activity. In the evening as they were so tired we had a film night, the film was great (Minion movie!). We even got popcorn so the kids were all really pleased, and will definitely sleep well. A long day, but worth every minute. The kids are loving it, and so am I! More updates tomorrow blog followers!! So today was mixed emotions, it was sad to see the children leaving but they had so much fun in the last morning with us. 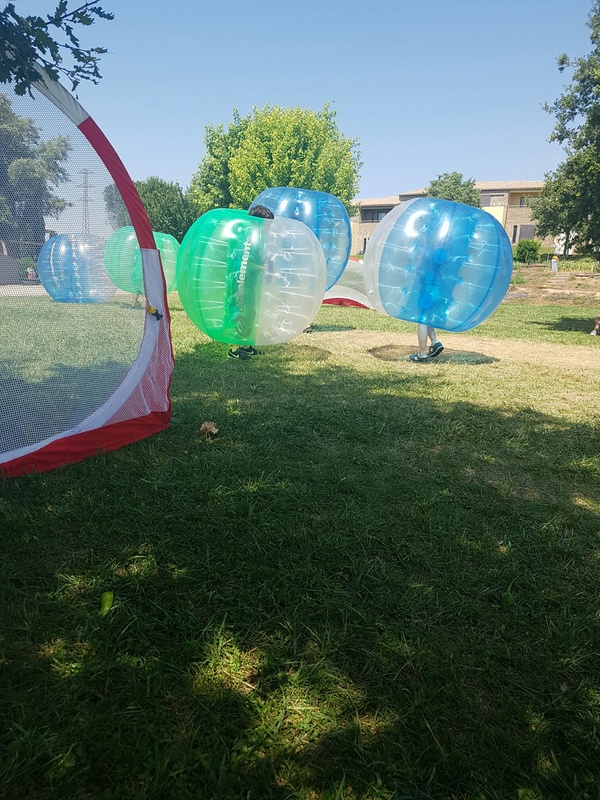 We did lots of different activities from parachute play, to juggling and bubbles, was really good fun and enjoyed by all, and then we got the bubble football out and they loved it all, adults and kids!! It’s been a fab evening too, the new recruits to the camp came at dinner time and we gave them a warm welcome, then played some location based activity games to help them get used to their surroundings. 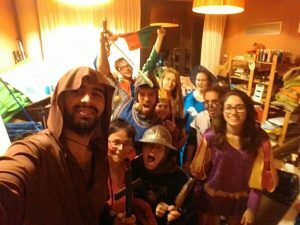 It was so much fun and dressing up as a wizard in the evening now feels like part of day to day life. I have however had a bit of a mishap and been bitten on the leg (unidentified vampire maybe) and unfortunately had a reaction in my muscle, so I won’t be doing the walk geomapping tomorrow, but I’m sure I will get a chance at some point. Sunday the 3rd….what a day. Imagine yourself, dear blog readers, you’re enjoying your last precious moments of sleep before you know the alarm is going to go off. You feel something on your head and immediately put it down to a room mate (there’s 4 of us in our room), and flick your hair thinking you will catch their hand….. imagine dear blog readers the shock of feeling a small furry bundle on your head and as I panic and flick it off it lands on my neighbour (Zali) and runs across her face ….. yes readers, George the field mouse decided to make a entrance! 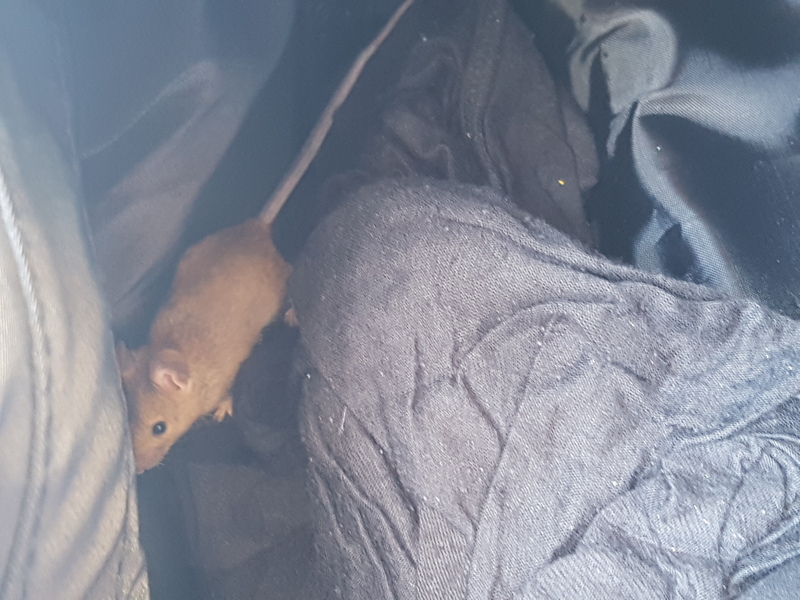 To make matters worse we then lost George… so while my fellow monitors go and do activities, I was on a mission… however I soon gave up and thought I would have a shower, on reaching into my bag I find George asleep in my t-shirt! Snug as a bug, or a mouse in this case!! I then tried to catch him and ended up taking the whole bag outside to remove items one by one as to not hurt him. He then happily ran off to freedom and to a new adventure (or a new room). Quite the adventure. For all those who would like to see George here’s a quick piccy before he left the building. 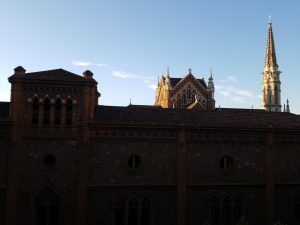 Also included is the beautiful scenery of Cardona castle, took as the sun was blazing down. 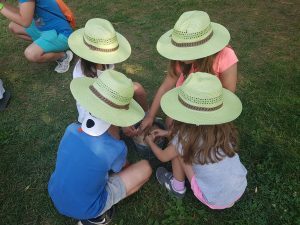 The kids did a few activities today such as rock climbing, and a code breaking game, they are so bright at picking things up fast. They are teaching us more Catalan/Spanish daily. Enjoying the whole experience so far. Highly recommended for all who want to get a different perspective of kids camps over in Spain. 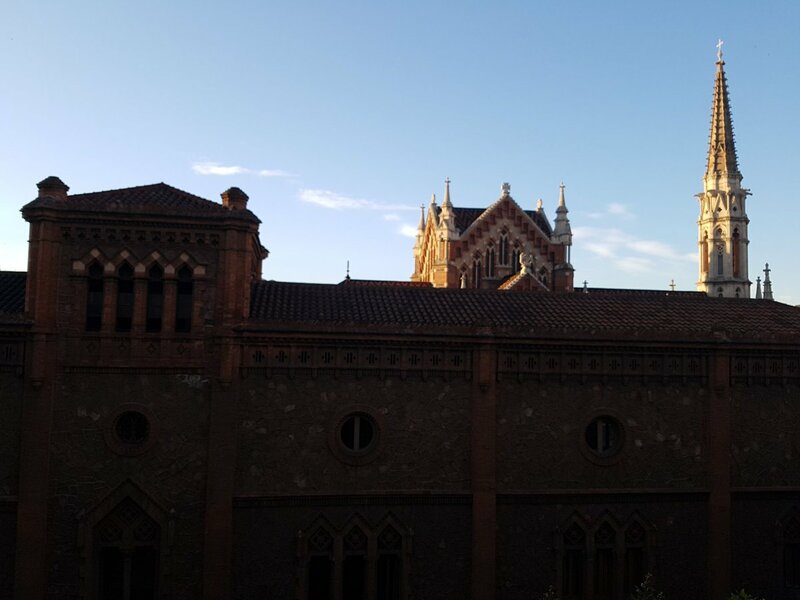 X Factor – Cardona Edition! Started well, no George the mouse, kind of missed the little fella! We can only hope hes happy in his new abode. Our first child free day (thank you Anna). 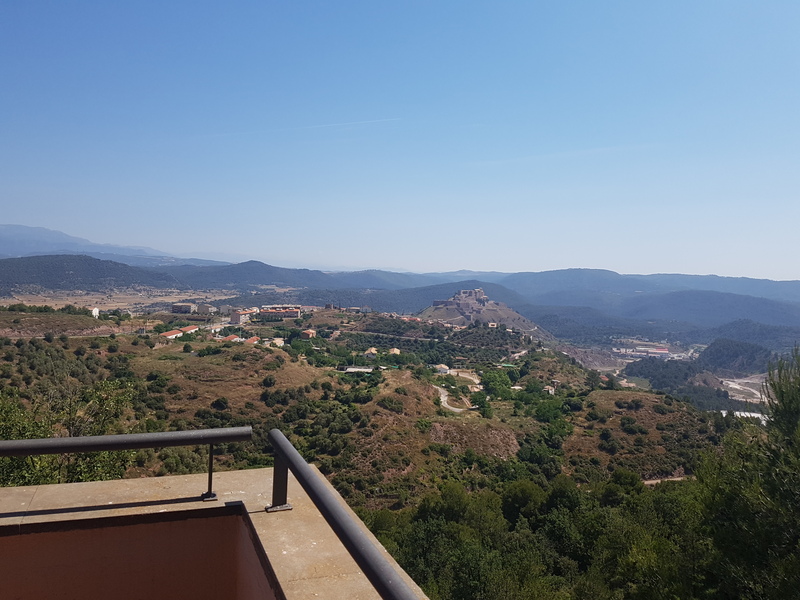 We went on a walk (hike if you have tiny legs like myself) to Cardona town, to do a little touristy browse, and loved the old cobbled streets and views of the castle. Definitely worth a visit for any history fans, the views are spectacular, and the fields of bales made me feel at home. We then had a lovely swim, and to top it off a cold Coke in the bar, and then a shower ready to meet the kids for the evening activities. 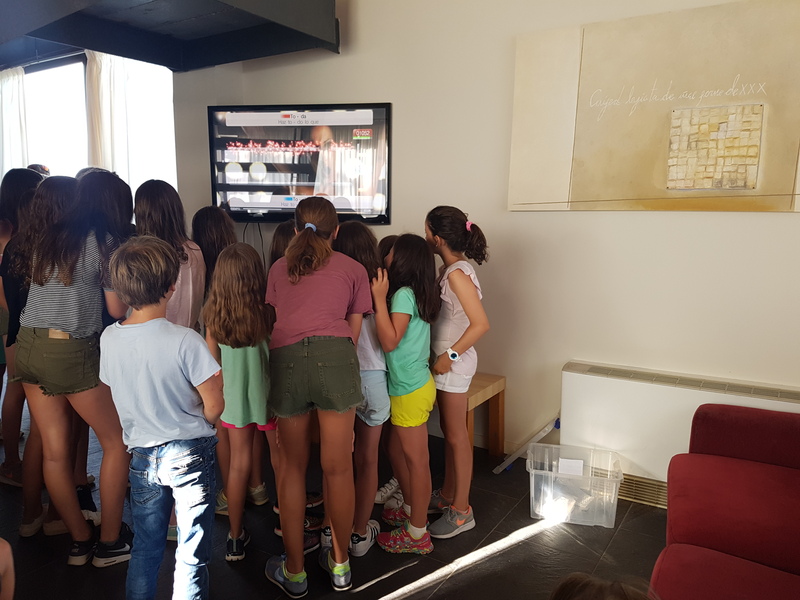 The kids went karting and swimming (not at the same time) for about 45 minutes away from the Vilar de Rural, and then in the evening we decided not to strain them and do more activities but to instead watch a movie (the new 2015 Peter pan) and played some Sing Star. We tried to get the kids to do group work and mix the ages, it’s sad when the older ones tend to stick together as the younger ones get a little left out. We try to mix where possible. Anyway happy reading blog checkers, can’t believe our time here is nearly up. Which means back to Barcelona for a few days then home. Well it’s been a fun filled action packed day today, we have had scootering, jousting (foam of course) and biking in camp today, the kids are absolutely shattered and so are us monitors and the teachers too. Just a little bit of jousting! Sun and activities is fun to a certain point, but kids do tend to get naggy and miserable as the day goes on, so we have been trying to save running games and crafting until evening as it’s cool for one thing and the kids want to participate more. They absolutely love competing against each other, and the thrill of chasing games is always good no matter the age. We are hopefully going to be planning a talent contest for tomorrow, I can’t wait, I really love this kind of thing, helps the kids get creative too, coming up with something in small groups and planning a routine etc. Anyway short and sweet tonight all, as I’m fairly tired. So our last full day has come in Cardona dear blog readers. And I have to say it’s been a blast, yes we are tired, but looking at these kids faces brightens your day. 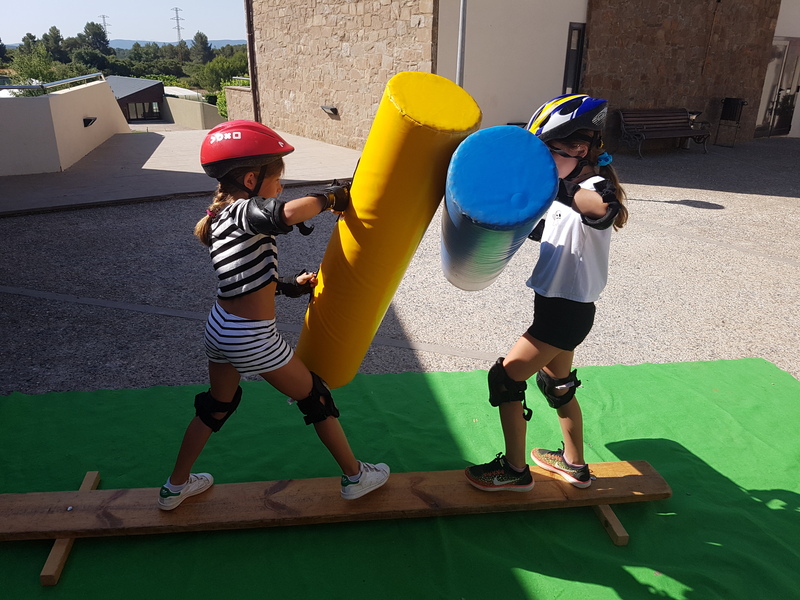 Today we did some more jousting and a really good activity, which I personally feel is a bit like the gladiators duel match (do any of you remember this? )… I felt my self wanting to shout ‘gladiator ready, 3,2,1….goooo! !’ I held it in as much as I could but I think I might of said it once or twice and got some confused looks from the children. In the afternoon they planned their talent shows, and made slime in a science class, it was really interesting to see who listened to the instructions well enough to make the slime. Which they all did mostly, and it came out very well. All in all the children seemed to have a great day, and we finished it with a last night at camp disco, which was really fun. And they also shared what they liked about the camp, one little girl said she made friends, and I think that’s the main thing of these camps, they help to form bonds, which I think we as a team have done well at. Tomorrow we move back to the city for 2 nights before home. Keep checking for updates. Check back in soon for more updates from our intrepid travellers! https://jobs.yha.org.uk/wp-content/uploads/2016/06/Barce-1.jpg 900 1200 admin https://jobs.yha.org.uk/wp-content/uploads/2015/08/YHA_Logo_CMYK_green_v7.png admin2016-06-21 08:39:252016-07-12 14:55:42Zali and Kayleigh Take On Ribals!